ALEXANDRIA, Va. 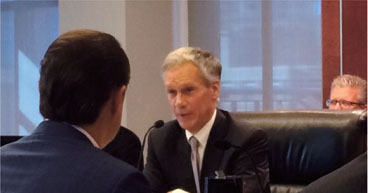 The NCUA Board approved a 4.2% budget increase for the fiscal year 2015 in a monthly meeting that was filled with tension, thanks to debate between Chairman Debbie Matz and Board Member J. Mark McWatters. ALEXANDRIA, Va. — The NCUA Board approved a 4.2% budget increase for the fiscal year 2015 in a monthly meeting that was filled with tension, thanks to debate between Chairman Debbie Matz and Board Member J. Mark McWatters.